A new vision for Swansea city centre has been welcomed by Dawsons Property’s Senior Partner Chris Hope. 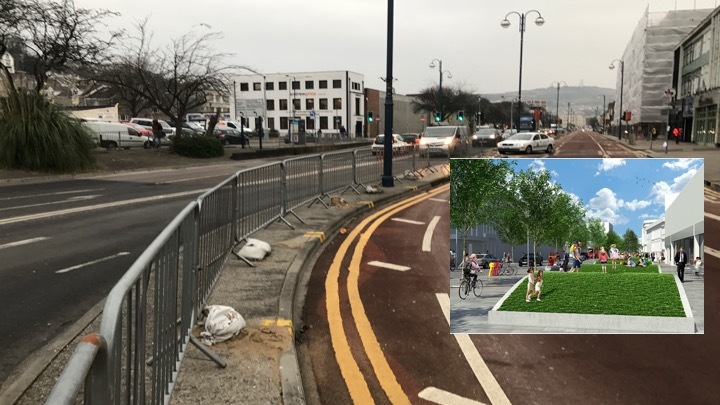 And part of that redevelopment plan is a £10m scheme to give The Kingsway an exciting new facelift which will see a new road layout to help cater for a new urban park. A public consultation has begun on the revamp, which will remove the existing two lanes of traffic on the northern side of The Kingsway. The redevelopment of The Kingsway will also include the introduction of two-way traffic along surrounding roads including, Alexandra Road, Mansel Street, Orchard Street, De La Beche Street and Belle Vue Way. “There is much to be admired about the way Swansea is going to be transformed over the next few years,” said Chris. “And having a fully functioning road system that everyone understands is important for the well-being of the city. “If all this comes to fruition, along with the £1.3b city deal, then Swansea is going to be a city on the up and a very much more attractive place for people to come and live. The regeneration plans for The Kingsway focus more heavily on pedestrians and making the route a destination for shoppers/visitors and city centre workers. It’s proposed that disruption will be kept to a minimum, with night-time working likely with the public consultation process running until the end of March, with work, subject to agreement, starting in the middle of the year. The proposed new layout will see the current bus lane removed to allow traffic to travel in both directions on the southern side of the carriageway. Work is expected to start along the route later this year, once full approval has been given.